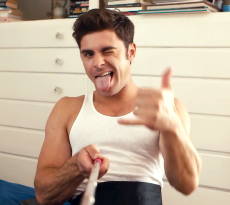 No upcoming Zac Efron film is truly official until the first shirtless photos from on-set surface. His newest film, Baywatch, is no exception. Earlier today in Miami, Zac stripped down once again as he performed his lifeguard training maneuvers. Showing off his toned abs, bicep veins, a shaved face, and some new highlights in his hair (We’re into it, tbh), Mr. Efron has never looked better!